Last week was our 5th Balkans Semester for the Study of War and Peace conference. This year's theme was "Engaging Violence: an Interdisciplinary Response" and students were asked to respond to the question: "How do we respond to violence?" At Jasenovac concentration camp, between 80,000 and 100,000 ethnic Serbs, Jews and Roma people as well as political enemies of the Ustaša regime were killed. Among the dead, around 20,000 were children. The land, however, bears no mark of this. All that remains of the camp is the rail line along the river Sava through which prisoners were transported and an empty field, the buildings having been burned at the end of WWII. Our desire is that in the lives of our alumni, peacemaking continues beyond the theoretical and into the practical and vocational. Of course, this practical application will manifest itself differently in light of each individual’s passion, and the scope is not limited solely to career. In order to gain some insight into the lives of our alumni, we recently caught up with two alumni to learn about how they are applying what they learned while with us. Spring [Cohort 2018] is Here! Spring 2016 marked the 4th Balkans Semester for the Study of War and Peace. Ten students joined us, two from Wheaton College (IL) and eight from Gordon College. They represented sociology, political science, social work, international relations, peace and conflict studies, and economics departments. Some highlights of this semester were our trip to Sarajevo and Srebrenica in late March, a spring break road trip down the coast of Croatia for almost all of the students, a weekend getaway to Slunj, collaborating with an NGO in Vukovar to host a youth workshop, visiting a Roma village, and our academic conference. This year’s conference, “Looking Ahead: Challenges and Opportunities of Post-Conflict Reconstruction,” was unique among our conferences in that it took a more reconstructionary approach, with student and faculty presentations focusing primarily on the praxis of reconstruction in the aftermath of conflict. In the weeks leading up to the conference and end of the semester, students concluded their internships and participated in one of two specialized classes: Conflict Transformation & Reconciliation, and Religion, Identity, and Conflict. Visiting professors teaching the courses included Daniel Johnson (professor and chair of Gordon College’s sociology department) and Judith Oleson, and guest lecturer Brian Howell (professor of Cultural Anthropology at Wheaton College). Following each student presentation panel, we had a time for Q & A wherein students defended and explained their thesis in further detail. The conference proved to be an exciting wrap up to the academic semester. Following the conference, we packed up in Zagreb and all traveled to the beautiful island of Vis for a debriefing retreat and re-entry exercises. Vis is two-and-a-half hours from Split by ferry and is a quiet, wild island still hidden from tourist hoards. The two small cities on the island are provincial, giving us space to relax while still experiencing Croatian coastal life. Besides breathing in the salty, fresh air and soaking up the sun, students were able to spend these few days reflecting back on the semester and preparing to return home. At one point, students were asked to find an object to represent their experience of the semester and share it with the group. One student picked up sea glass expressing how the semester was challenging, but in the challenges, she was refined--much like sea glass. Another student picked up two rocks: one was black and white and the other was a mixture of whites, grays, and colors. She explained how at the beginning of the semester, conflicts seemed black and white to her: there were “good” people/ideas/things and “bad” people/ideas/things. However, she explained, in looking closely at one conflict all semester, hearing various perspectives, she has come to see the world as a bit more complicated, a bit more gray. She learned to listen and not be content with shallow solutions. We are so proud of these ten students and the hard work that they put into this past semester. It was a joy to watch each student face individual challenges and questions, making connections to their personal and spiritual life, and thus grow in their own way. We look forward to seeing where these students end up in the years to come! The 2015 Spring Semester for the Study of War and Peace drew to a close last month. The last three weeks of our time together were spent on the southern Croatian coast, in the historic city of Dubrovnik. After three weeks of specialized classes with visiting professors from Gordon College, the semester concluded with an academic conference. All students, along with the three visiting professors and one key note speaker, presented current work on topics related to peace, war, healing, remembering, and reconciliation. A Competition of Identities: Victimhood in the Balkans and the Implications for Reconciliation. Social Inclusion of Roma Communities in Northern Croatia. A Spirit Of Ilm: Mining The Islamic Tradition In Bosnia As An Element In Finding Peace After Atrocity. The Deliberately Unsatisfying Nature of Dialogue and Reconciliation. A segment for questions and answers followed after every few presentations and acted as a platform from which to further discuss the important ideas, concepts and links found among the various research. Students and faculty alike used this space to discuss how their ideas fit together and complemented each other and drew out how varying perspectives might prompt further research and development in someone else’s project. As previously mentioned this conference also featured three visiting professors, namely Dr. Ruth Melkonian-Hoover (Department Chair and Associate Professor of Political Science), Dr. Daniel Johnson (Professor of Sociology), and Professor John Sarrouf (Director of Program Development and Strategic Partnerships at the Public Conversations Project). This group of faculty joined the program in May in order to each teach a three-week-long seminar course leading up to the conference. At the conference itself, each professor presented a piece of their current work, applicable to the overarching theme and focus of the semester. Again, students were able to ask questions, discuss, and comment on papers and brand new research in the field of peacemaking, thus allowing for a unique interchange between faculty and students in a setting unlike the typical academic classroom. “After all the research was said and done, I was glad to have found the topic of my conference research. At the end of it all, I knew that I believed what I was saying which gave me the confidence to go into the conference room, generally worry-free. Correspondingly, I was able to experience the same of others. After hearing everyone’s presentations, I felt as if I experienced a little piece of everyone’s heart and mind in the process. Each person came to the topic that they did through personal reflection and contemplation. It was a privilege to hear from my classmates in that way. It was also interesting to note whose ideas lined up with my own and whose did not. Overall, I was really proud of everyone who presented. Hearing from the faculty was inspiring and enlightening. It was such a delight to hear about what they had been contemplating throughout this experience as well”. The keynote address was given by Dr. Richard Kearney, Professor of Philosophy at Boston College and author of many books including, Strangers, Gods, and Monsters. Dr. Kearney spoke eloquently on the subject of hospitality and the relationship between peace and one's willingness to welcome the other. Dr. Kearney concluded by introducing a project which he and the Balkans Semester program directors, Petra and James Taylor, launched through Boston College called The Guestbook Project. The Guestbook Project is “an international venture committed to transforming hostility into hospitality, enmity into empathy, conflict into conversation”. It works towards these goals by helping young people from different sides of conflict come together to share their own stories and hear stories from those on the other side. Put simply, the Guestbook Project strives to promote peace-building through the narratives found in storytelling. For the faculty, students, and staff of the Balkans Semester, this conference was both the capstone and the conclusion of over three months of work. Our farewell marked the end of a full semester, but not the end of our journey. For many, the conference represented only the beginning of a collective movement towards and exploration of reconciliation, on the national, inter-personal and individual levels. Our last night in Dubrovnik. A big "Thank You" to all of our students who worked incredibly hard this past semester and put together thoughtful presentations. Congratulations on a successful semester and good luck as you continue your studies or begin your careers post-grad. Thank you to our faculty who enriched this experience through the seminar classes in Dubrovnik. We so greatly appreciate your hard work and dedication to our students. It was an honor hosting Dr. Richard Kearney as our key note speaker, especially after having studied some of his texts throughout the semester. Lastly a huge "THANK YOU" to our program directors who are so faithfully committed to this program and its participating students. The Battle of Vukovar was an 87 day siege of the Croatian city of Vukovar which took place during the latter part of 1991. After being shelled at a rate of up to 12,000 rockets and shells per day, Vukovar fell in November, 1991. During the battle, over 450 people took refuge in the basement of the Vukovar hospital. Men, women, children, and wounded citizens were among those who sought safety there. A large red cross was placed on the roof of the building in hope that the facility would not be targeted. However, the hospital was bombed on a daily basis. As a result, the top four floors of the hospital were destroyed. Only the ground floor and basement remained somewhat intact. This cross hangs in remembrance of the red cross painted on the hospital roof which was bombed during the siege. The massacre at the Vukovar hospital occurred on the 20th of November 1991. During the final days of this battle, an evacuation of the hospital was negotiated between the military and the International Committee of the Red Cross. While some hospital residents were safely removed and taken to further care, other civilians and prisoners of war were secretly relocated to "Ovčara Farm". Here people from the hospital were beaten for several hours before they were taken to a prepared site to be killed. Their mass grave was discovered in 1992. Four years later over 200 sets of remains were exhumed from the grave - many more are still missing. To this day, bodies from the grave are being identified through a lengthy and emotionally taxing process. The Vukovar Memorial at the site of the mass grave. During a recent trip, our cohort was able to tour the hospital in Vukovar. The hospital has been rebuilt now, but the floor where the patients took shelter during the siege remains largely unchanged in its structure. We walked through various rooms with bunks, hospital beds, stretchers, medicine closets, a maternity ward and operating room. One room has been transformed into a memorial for those killed in Ovčara. For 24 hours a day, 365 days a year, a candle burns and the names of the victims killed at Ovčara are listed off via a recording. As we walked through the hospital our tour guide told us about the challenges of life in the hospital during the siege - stories of overcrowding, fear, and uncertainty. She pointed out the tiles on one wall of the long narrow hallway which represented the victims of the massacre. There is also a space representing people who are still missing or have yet to be identified. Our tour guide shared the story of a time that a bomb had fallen through all four stories of the hospital above and landed, miraculously undetonated, in the basement among the patients. She shared about each of the rooms and the purpose each of them served during the siege. The stories were increasingly harder to hear as the visuals were sinking in and we were experiencing the smallness of the basement space. After reflecting on all that I saw and heard at the Vukovar hospital, I am tempted to become lost in frustration and confusion about why these kinds of atrocities are committed. While I grapple through my own questions and feelings, I must remember that this place of dying is simultaneously a place of healing. Today, as well as throughout the siege, the Vukovar hospital is functioning. People are still experiencing healing and recovery there. The people of Vukovar fought to keep others alive and well, even underground, even when the bombs were falling. Medical personnel worked around the clock attending to the hurt and wounded, keeping them alive. Refugees lived in unimaginably tight quarters with few supplies yet some were able to start rebuilding their identities once the siege ended. In moving forward in my processing and studying, I must reflect on this resilience. I seek to fill my minds space not so much with the atrocity and violence, but may I rather celebrate those who fought for life and healing. My hope for this time of reflection after our visit to Vukovar is that I myself along with the cohort would not be consumed solely by the pain and the confusion, though it must be acknowledged and taken seriously. Rather let us also take time to reflect on those who fought to live. In the midst of the pain, let me also remember life. Sarah Cox is a rising senior at Gordon College where she studies political science and Biblical studies. During her time in Croatia she has interned with both Transparency International and the European Center for the Study for War and Peace. After graduation Sarah hopes to attend law school. The Gordon College Spring ’15 Cohort spent this past week in Sarajevo, Bosnia. Upon our arrival we took a walking tour of the city, seeing both the Ottoman and the newer sections of town. Within these first few hours of engagement with the city it became clear how close the war and siege of Sarajevo still are to both the city’s people and its physical appearance. In various places the pavement is marked by a “Sarajevo Rose”, a site where mortar shells hit and left their mark. The grooves in the pavement, the scars, have been filled with red paint, signifying the lives lost in that very place, in order not to forget the tragedy that once was reality. We met with the staff of the Center for Nonviolent Action, an NGO involved in various parts of former Yugoslavia. Through programming and advocacy they are seeking to build peace through dialogue, trust building across social borders, and working through past experiences and events in a constructive and healing manner. 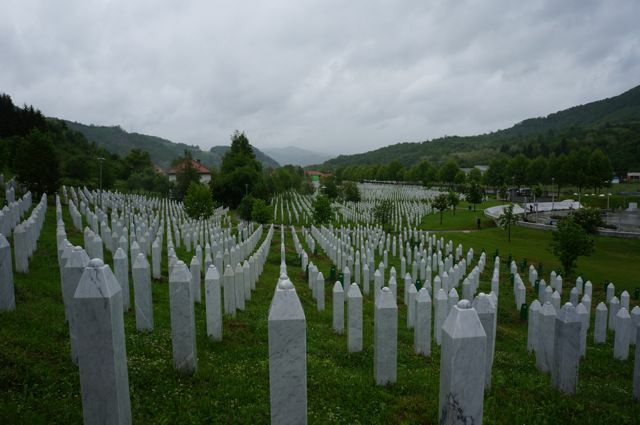 In anticipation of a trip to the Srebrenica memorial site, we visited the Srebrenica gallery in Sarajevo which exhibited photographs by Tarik Samarah. Despite having previously learned about the Srebrenica genocide, the photographs of victims, refugee camp living conditions, survivors, barren landscapes, mass graves and row upon row of coffins forced our engagement to a new level. Furthermore, being at the memorial site in the town of Srebrenica the next day brought this part of history much further and more tangibly into our realm of understanding. Though the memorial exhibits a fullness of sorts, with over 8000 headstones representing the lives of men of all ages, there is simultaneously a perceivable emptiness associated with every grave; emptiness in every family that lost a father, pain of every mother who lost a son, sisters who no longer have brothers, communities without their religious leaders, and beyond. As we stood on the outside looking in, we asked how we are to respond. What our responsibility is towards this atrocity? How we can best honor those who have lost, whose mourning may never end, who lived through this part of history and are still searching for what was lost and ways to move forward. How are we to best hold the pain, grief and loss in tension with our own identities, conflicts, realities? Only a few hours of sleep later, many students attended morning prayer at a local Sarajevo mosque, followed by conversation with the Imam and many community members over Bosanska kavu (coffee) and Turkish čaj (tea). We were incredibly encouraged by the Imam's honesty in retelling his experience with the war, conflict and spiritual trials, his openness in responding to our questions, and his eagerness to share insights on the pursuing of truth and peace in an inter-religious environment. We wrapped up our time in Sarajevo with a “Siege Tour” of various locations where the forces were stationed, high in the hills surrounding the city, during the four year siege. We walked through part of the Tunnel of Hope, connecting the city to a “safe zone” and representing the only way out of the city during the war, and trekked up the 1984 Olympic bobsled run, from which the city was frequently targeted. Now back in Zagreb, we continue processing through our experiences in Sarajevo. We are grateful for the opportunity of engaging with another place that is working through its recent past as it presently partakes in the process of healing, reconciliation and hopefully sustainable peace. We are excited to welcome the second cohort of students participating in the Balkans Semester for the Study of War & Peace. This group of 14 students from Gordon College will spend one semester studying war and peace, conflict reconciliation and transformation through course work, internships, and travel. Individually and as a group students will interact with questions of sustainable peace, justice and forgiveness, inter-cultural living, and inter-religious responses to war and approaches to peace. back row: Marco, Danielle, Claire, Noel, Sarah, Anna, Chanel, Rianna. front row: Chris, Adrianne, Emily, Lily, Sam, Sandev. Welcome to the European Center for the Study of War and Peace blog. Check back here for program updates, event information, and other news.